I expect even worse for her 'literary reputation' she writes not only for adults but for teenagers and children. 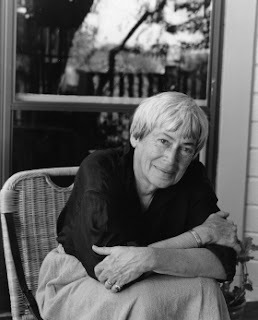 She has imagined a far more interesting wizard than Harry Potter, in Sparrowhawk for her Earthsea books (but has been ill-served by her translators into film, though this has attendant difficulties created by the fiction, given that a significant dimension of these stories are psychological and internal). But it is her 'adult' science fiction that she excels in creating worlds that imaginatively test our own. First because she explores alternative social structures - she is by conviction a skeptical but hopeful anarchist - that challenge our racism (Sparrowhawk is red skinned), our gender stereotyping, our fundamentalism, our misplaced evaluation of power. Second because she imagines societies that are a response to our collapse. She recognizes that our current ordering of things, grounded in perpetual growth, is unsustainable and is rightly questioning of our ability to change voluntary, without the corrective of necessary limits imposing themselves. She seeks to imagine orderings of society that are positive responses to that collapse, that see our potential lying in lives that are environmentally balanced, that eschew greed for proportion, and simplicity. This is reflected in her deep respect for Taoism (in both its naturalistic mysticism and in its potential social forms). Third, because she explores alternate societies with a deep respect for the interior psychological spaces of her characters. They are never sacrificed to ideology. Her fiction is imaginary before it is of ideas - which means that as created spaces their impact is so much deeper. She ought to be a Nobel candidate but alas that is seemingly preserved for 'real' fiction. There is no justice...but the valuation of the imagination will see her estate continually rise.